Tony Mantia, left, has his face buried in Key lime pie during the Mile High Key Lime Pie Eatin' Contest Saturday, July 4, 2015, in Key West, Fla. The winner was the person who consumed the 9-inch-in-diameter pastry the fastest without using hands. While Americans all over the country were celebrating the Fourth of July with pies, and apple pie is considered a national emblem, Key Westers were devoting themselves to the island chain's signature fruit — the Key lime. The annual Key Lime Festival celebrates the small, yellow limes with the distinctive flavor. The event includes a bar stroll, book signing, talent show, and of course pies. 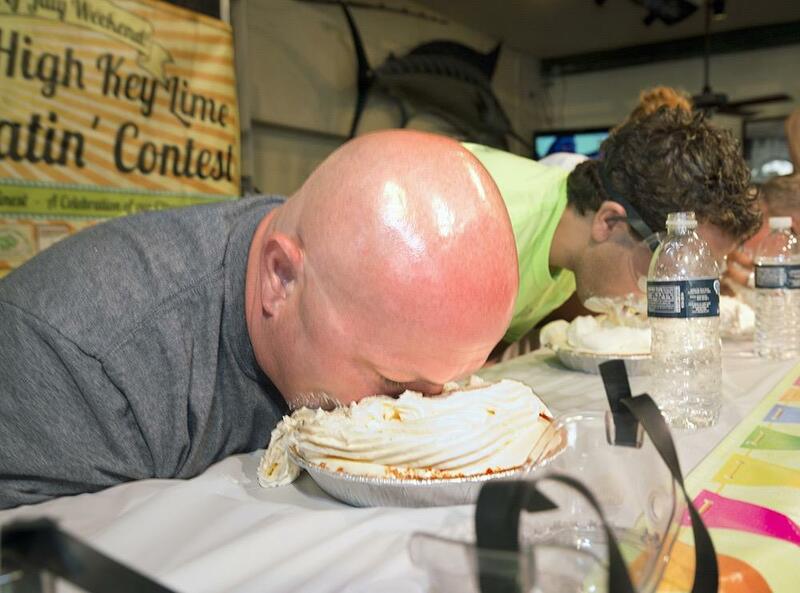 There was a pie-eating contest, Key West's answer to the Coney Island hot dog ritual, and a pie-making competition, which provided the opportunity for lots of pie tastings. "Key lime pie is kind of magical," said David Sloan, one of the festival organizers and author of "The Key Lime Pie Cookbook." "As silly as that sounds, it has the tartness and it has the sweetness. And it really is like magic when it dances around on your tongue. You get both flavors back and forth. It just really rounds things out and you're like, 'Ah. That's what heaven's like.'" Festival attendees were enjoying the tart flavor of the Key lime and the different crusts from the competition pies. 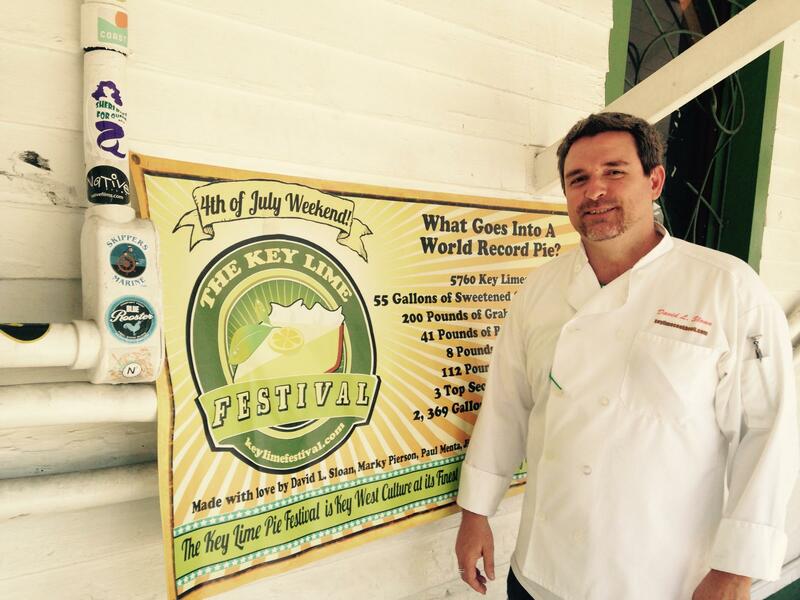 David Sloan is the author of the Key Lime Pie Cookbook and an organizer of the Key Lime Festival. Key West Mayor Craig Cates, a native of the island, said that when he was a kid and candy was scarce, they would make do with Key limes. "We used to take the Key limes and peel them and dip them in sugar," he said. "That was like our little dessert." Key Westers describe their love for Key limes. As a child I used to think that heaven was a Key Lime Pie. Well-- not exactly. But by the time that I could completely grasp the concept of heaven, I knew that I had already caught a glimpse of it when I ate one for the first time at a Denny's Restaurant off I-95 during a family roadtrip. Which means that I should have planned a trip south this Fourth of July, where what just might be the world's largest Key Lime Pie was baked for the Key Lime Festival. Bob Roth left Miami Beach for Davie over 40 years ago to open New River Groves where he sold oranges and other fruit. Little did he know that Key lime pies would put him on the map! We visit Bob at New River Groves , a charming store that’s reminiscent of life in the 50’s and 60’s. When posts like these flood your news feeds, you know it's peak season for the king of fruit. Mangos ripen during South Florida summers. And because they tend to grow right in people’s backyards, it’s become a tradition to share them with friends, family and co-workers. Scroll below for some mango shots from across South Florida, and share your mango photos with us on Facebook, Twitter and Instagram. It started with a trickle, a couple dozen people organizing signs and props at the Metromover station near the Adrienne Arsht Center for the Performing Arts. Eventually, it grew to a few hundred. These were protestors from groups like Occupy Miami, Green Party of Florida and GMO Free Florida. The groups were marching in solidarity for labeling of genetically modified foods, or what has become known as GMOs. One of the biggest manufacturers of GMOs, and the main target of the criticism from this weekend's protest, is Monsanto.